Analytical Instruments Sales & Service Pvt. Ltd. The New Kestrel 3000 has been redesigned for even better performance and functionality! 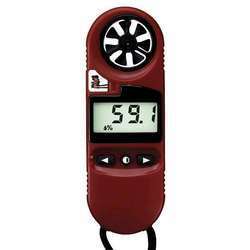 Measure every major environmental condition with this powerful hand-held instrument – barometric pressure, altitude, density altitude, temperature, humidity, wind speed, wind chill, dew point, wet bulb, and heat index. Using its chart mode, itcan recall and graph up to 250 measurements, along with storage times and dates.